As I was coming down a nice sweeping downhill lefthander on scenic Hwy 9 BOOM!!!! White smoke and blue blood everywhere. My upper radiator hose mount exploded. I shut it down in the curve and coasted to a stop in a church parking lot and sat for a couple of hours until friends could come get the family and I. Then the ultimate insult the WIFE used her Dodge truck and a car trailer to haul my BMW home. I don't see how at @85k miles a radiator blows. The wife's dodge 90k miles 1998 model no cooling problems, it replaced a 1974 dodge that my cousin still has no cooling problems, It replaced a 1953 Dodge that when it finally rusted to death in the 80's had the original cooling system. If Dodge can build that good of a radiator when they are rated almost last in consumer satisfaction why can BMW the pinnacle of engineering not build a decent cooling system? Very common on these cars. The cooling systems are weak and the BMW coolant doesn't seem to help. They didn't build the radiator, Behr did. Radiators should be changed just before 90K miles. I assume you didn't blow the head gasket. I had a 92 535i with the robust M30. I hear that the M30 is one of the best BMW engines ever made. While I liked the power from that engine, I disagree with that statment. I had 2 blown head gaskets (at seperate times) because the needle creeped 1/2 way into the red, NOT into the red. The M30 is such a baby in that way. My wife's old car, a 99 528i sport, overheaded just before we sold it, and it went into the red and she kept driving for another mile!!!!!!!!!!!!! and it did not blow the head gasket nor crack the head, etc... Consider yourself lucky . Saying it isn't really BMW's fault (no reason they have to buy from Behr, is there?) and that it should be 'normal maintenance' is pointless. You are absolutely right. There is no fathomable excuse for this. Why should Buick and Dodge owners get off so easily? Much as I like them, BMW as a company does some stupendously stupid things. After reading numerous suggestions in Roundel Tech Talk, I made a preemptive overhaul of the cooling system (radiator, pump, thermostat & housing, belts) at 140K miles. I figured I was on borrowed time and wanted to avoid catastrophic failure. I suspect the 6-cylinder isn't as tough on the cooling system as the V8 is. The job itself wasn't too bad, but you must have the special wrench and pulley hold-back tool to remove the fan clutch. It's left hand threaded. I forgot to replace the plastic overflow bottle; that'll be next. Well, the way things are going, no new cars are built to last. 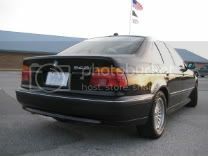 Every newer car I have worked on can be outlasted by a well maintained E28, E34, E30, etc. and the reason is usually the EPA. M30s are not babies. The last gen were already running very hot under normal operating conditions. The early ones ran cold and could be overheated to a certain extent before the heads cracked. The ones after the cylinder head update were nearly bullet proof. Then due to emissions, they had to run them lean and hot, and that is just not what they were designed for nearly 3 decades earlier. The V8 cooling system is just as fragile. I have replaced many blown up expansion tanks. The reason there was our friends at the EPA again. They required caps that would vent at higher pressures than before and cars that are run above boiling point under normal conditions. The M60 t-stat normally opens at 105C! At that temp, the pressures can get very high and the caps are not allowed to vent, so you end up with cooling systems that undergo extreme heating and cooling cycles and pressure cycles. This results in cyclic failure. The average newer non-truck American car that is forced to achieve the levels of power and fuel economy that the average BMW can has all the same sorts of problems. So you see, it is not really BMWs fault in the scheme of things. My E30 blew a water hose on this EXACT road. It seems to hate radiators/radiator related things, but damn its fun to drive. Were you coming from or heading to Santa Cruz? Interested on going on a drive sometime? Have seen my share of cooked M50/52/54 engines. Have not seen as many cooked M30s or blown head gaskets. The second one may be a result of improper installation or a poor quality part from the first replacement. I will tell you right now I have never had to replace a blown head gasket on an M30, and I have worked on lots and lots of them. My old boss has an 89 535i with over 300k (the odometer stopped counting), I have an E28 535is with almost 300k, and my ex GF had an E28 with over 325k when she totalled it, all original head gaskets. Like I said, it was not designed to run as hot as the M50, but if you don't abuse it and run it out of coolant or keep driving it after losing a radiator, you have no worries. The M30 is a good engine, but I would never own another M30 powered bimmer because of my bad experiences. IMHO, the M50 range is more reliable than the M30 range. I will stick to the M50 (and N50 engines when I can afford them ). The M20 engine that I have in my 528e has had zero problems in the 12 years, 90000 miles I have driven it. Funny thing about my 528e is that the auxilary fan has never worked, yet the car never creeps past the 1/2 mark even when at idle for extended periods of time. The 528e has a much bigger radiator than the 325e. Most of the time the aux fan doesn't ever come on in the old cars anyway unless you are running the AC. The M54 is extremely sensitive to overheating due to the aluminum block. If you overheat one of those, it _will_ need a motor. Many mechanics I have talked to have found this to be true. There are lots of people that have overheated, rebuilt the head and gotten to the final torque sequence only to have the threads pull out of the block. Some have used time-serts and had those pull out of the block. The dealers often stock the M54 engines because of this and you can usually find freshly rebuild heads really cheap because of this. Sorry you have had a bad experience with the M30, but it is one of the best engines BMW ever built along with the M50/M52US and M20, but not the M54 or the N54. My Hwy 9 is in the Ozark Mountains of Arkansas. Beautiful twisty, hilly road . I started driving it when I had a modified 88 Toyota MR2 SC . I was smiling until the boom. Oh well Fedex just delivered time to fix the problem. Any thoughts/opinions on the M62TU? Car 'manufacturers' actually 'make' few of the parts or components of the cars that bear their name, I think they really just design bodies and assemble cars...there is no excuse that BMW doesn't make it, they are responsible for the reliability and design of everything that goes into their cars...I don't know the reliance of most Japanese mfgrs on subcontracting out components but they seem to build much more reliable cars. At 67k i had the same issue with my 2000 E39 528i. BMW had to replace the entire cooling system. I'm seeing a lot of excuses here for premature radiator failure. On my lowly 1987 Integra which I put well over 200K miles, I never had anything resembling a radiator failure and this car was abused (I was a teenager). That was a lowly $11K car in 1987. But it's perfectly acceptable more than 20 years later for BMWs to experience this failure in less than 100K miles? That's absurd. I'm seeing a lot of excuses here for premature radiator failure. Are you reading the same thread I am? The only thing even approaching an 'excuse' here is that Behr built the radiators. Everything else is a simple recognition of the fact that these things do fail far sooner than they should and that, if you want your car to survive, you will deal with that fact in a timely manner. The majority of the judgmental comment here is that there is no excuse for this from BMW. On my lowly 1987 Integra which I put well over 200K miles, I never had anything resembling a radiator failure and this car was abused (I was a teenager). That was a lowly $11K car in 1987. But it's perfectly acceptable more than 20 years later for BMWs to experience this failure in less than 100K miles? That's absurd. What's absurd is for you to conclude that anyone here was being an apologist for BMW. This is the same kind of issue as the cracking clutch pedal bracket on the E28. No; it is not acceptable for this to happen, but it does. If you want to drive an E28, that's a fact you live with and a part you replace if you want to keep on driving it. The key here is that your car was an 87. I have seen plenty of 87 bimmers on their original radiators. My last E30 had over 265k on the original radiator when I parted out the car. I believe the key is not who manufactured the radiator, but the fact that the hose broke at the plastic inlet/outlet. Was the hose clamp properly placed and torqued? After several years of heat cycling the plastic apparently weakens, and you have this failure. I've seen it on E36, E46, E34 and E39 models. Most of my cars have metal radiators. You might a metal one for your car, perhaps from Nissen (NOT Nissan), as well as a metal thermostat housing to help avoid future failures.